The Democratic chairman of the House Homeland Security Committee said that he "would not rule out a wall in certain instances" after President Donald Trump proposed a new immigration and border security plan Saturday in an attempt to end the partial government shutdown. On Saturday, in an address from the White House, Trump proposed an immigration and border security plan in an effort to end the shutdown and "solve the crisis on the southern border." Along with other border security measures that both parties support, the core of the plan includes $5.7 billion to build an additional 230 miles of a see-through steel barrier system -- "or a wall." "This is not a 2,000-mile concrete structure from sea to sea. These are steel barriers in high-priority locations," Trump said. On "This Week," Thompson told co-anchor Martha Raddatz, "The notion that we can't have barriers is just something that's not true, but again ... you have to have a plan, and the plan that the president initially started with is not where he is now. And so we don't know where he will be tomorrow, but clearly, Democrats are for border security, but we're not for this constantly moving the ball just for a talking point." 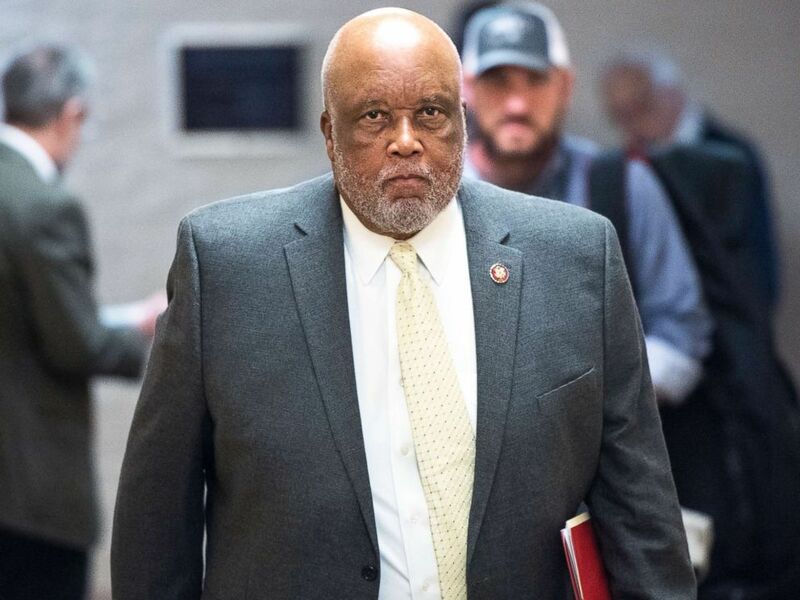 Rep. Bennie Thompson leaves the House Democrats' caucus meeting in the Capitol in Washington, on Jan. 4, 2019. In an effort to entice Democrats to support the deal, Trump on Saturday also proposed extending protections from deportation for three years for some 700,000 so-called "Dreamers," children brought to the U.S. illegally by their parents who were given a protected status under former President Barack Obama's Deferred Action for Childhood Arrivals (DACA) executive order, and for Temporary Protected Status recipients whose status is currently facing expiration. Thompson told Raddatz that Democrats will work with the president, but noted that he "can't pick what Democrats" he works with. "We have picked our leaders and you have to work with our leaders," Thompson said, addressing the president directly. "And I encourage you to do that." And Thompson put the blame for the shutdown on the president, saying he should re-open the government first. House Speaker Nancy Pelosi, D-Calif., and Senate Minority Leader Chuck Schumer, D-N.Y., both issued statements rejecting the president's proposal. Pelosi called the plan a "non-starter" and Schumer said Trump offering DACA protections in exchange for wall funding, after "it was the president who single-handedly" took them away in the first place, is "hostage taking." Thompson acknowledged that the country is facing a humanitarian crisis, but said that the administration has made the crisis at the border worse through Trump's policies. "So if he accepts responsibility for what he's created, then we can fix it," Thompson said. He added "Democrats have always supported humanitarian efforts all around the world" and that "we are prepared to work through the humanitarian crisis." The president's plan is expected to be taken up by the Senate this week, according to Senate Majority Leader Mitch McConnell, R-Ky.